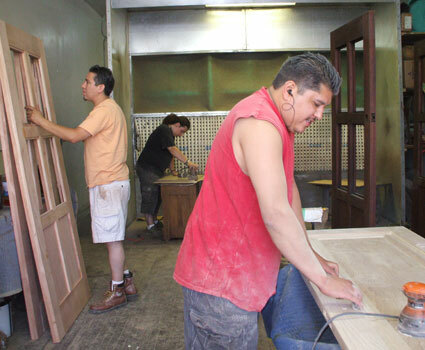 We provide on-site wood stripping and refinishing for wood fixtures like doors and windows, trim (molding) and staircases, church pews and other hard-to-remove objects. While refinishing can be a somewhat messy process, we will take great care to protect your surroundings by covering floors, walls and furniture. Our experienced refinishers can match an existing stain and finish, or we can apply a color stain of your choosing. Our skilled woodworkers will re-glue, repair and restore antique furniture to its original finish and condition. For chairs and other pieces that have been upholstered, we will re-upholster with a fabric you provide. We refinish hardwood floors to their original luster, or we will install new hardwood flooring. Visit our showroom to see different options in wood, stains and finishes. Our expert woodworkers will construct custom kitchen cabinets or design custom-built furniture in a variety of woods and finishes. Call us at 773-478-6500 for more information or a free estimate. Visit our showroom to see our wide variety of picture frame options.